Every sound and texture is replaced across all versions of the game, and in 1.45 INCLUDES all of the EQUINE sounds!!! The sound pack adds very realistic sounds, all original music to records and ambient tracks, and offers a fresh and stunning new take on the entirety of the realm of Minecraft. It truly is like playing an entirely different game! Vanilla sounds like a box of toys...SnowSong sounds like a FULLY immersive artistic expression! You WILL be amazed! You WILL be terrified! You WILL find yourself becoming more deeply buried in the Mines than ever. AND you're gonna LOVE IT! Resolutions from 64x to 512x are available. By Default 64x is the one that shows but the other resolutions are listed as additional files. Resolutions from 64x to 512x! All music discs are replaced with original songs by Alecia M. Shepherd! All ambient music tracks are replaced with original compositions and performances by Alecia Shepherd, specifically for Minecraft by AMS/Sn0wShepherd, including the extensive new song selection in 1.7.X and I did all this work for FREE! Eat that, C418!!! Boss fight music for the Wither and for the Ender Dragon! Every sound effect replaced for every version of Vanilla! Not one sound left inferior! Expanded song selections for ambiance without replacing files! Really spooky cave ambiance...MIND-BLOWING realism that will frighten your nose rings out! Even scarier monsters! Renew your anxiety and fear by adjusting to the new mob sounds; and trust me, they are designed to be VERY scary and realistic; and sometimes utterly terrifying (just ask the cows!). Multiple versions to tailor your experience to your preferences with 60 full original scores of MUSIC MUSIC MUSIC, precious blessed MUSIC, composed in the midst of my most musically creative year EVER! No-Hurt versions of SnowSong assure that you hear no screeches of pain or death from any of the real-to-life animals such as duckens, cows, pigs, etc...monsters still have injury and death sounds. Files hosted personally and privately so NO ADS EVER! Always gonna be 100% FREE! No monetization, NO ADS, just get it, click it and enjoy! YEAH! And now featuring BLAZE-Approved fast download speeds!!! Could you add connected textures, please? e.g. for Glass/panes, bookshelfs, glowstone and more. Right now these packages are for vanilla only. Sn0w is currently working on mod packs which we will release as they are completed. so where can i find a list of mods that it currently works with? Already in the works. 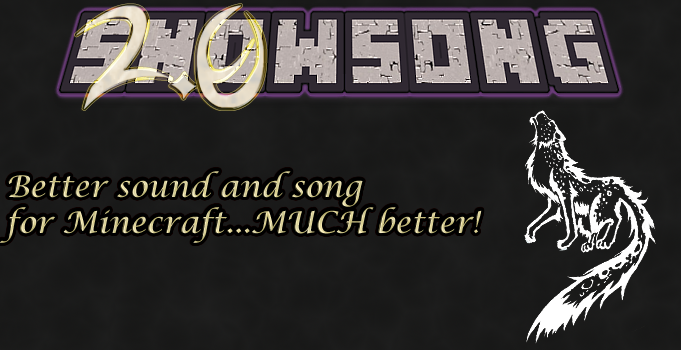 Sn0wSong is already updated and should be available by the end of this weekend, the textures are currently being worked on as there are a bunch of new ones as well as a new format.